Cold steel are among one of the best known American blade smiths. And it was about high time I tested them out. I had been given a DVD of their promo test cutting footage a number of years ago as was remarkably impressed by the strength and resilience of the blades on the footage and the seemingly unrelenting sharpness held by their blades...and the fact the videos had hilariously bad cutting demo's on them. It was also an excellent opportunity as I'd received some excellent news from one of my senior instructors. 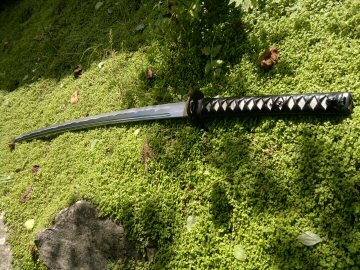 As a student of traditional Koryū Iaido (old school Japanese Swordsmanship) in Ireland I study both the practical methods of sword fighting but also the many aspects of Japanese martial history and culture. 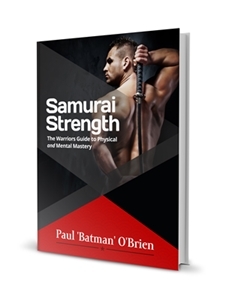 The sword obviously holds a position of great importance and focus in both the martial arts and Japanese history. 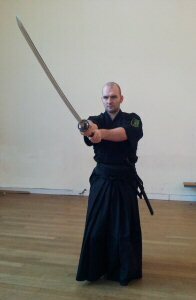 In our school of Iaido, as in many others, we focus on the techniques of the long sword, the katana. Over the last year though I have been privileged to be introduced to the short sword forms contained within our style also, and have spent some time studying both solo kodachi (小太刀) techniques and those involving daishō (大小). Recently I commented on this during some personal instruction time with one of the most senior Iaidoka in Europe, Kyoshi Dave Ansell, and he mentioned that as part of enbu (official demonstrations) it was acceptable and in fact, the done thing, to wear the daishō. 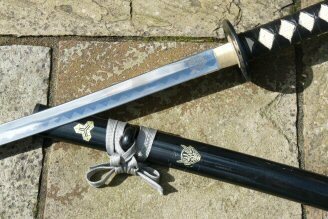 With that, I was given permission by Sensei Ansell to wear both swords, again this is quite rare within our training community and it was, for me, a great honour to be allowed to partake in this tradition. Of course, that left me with a dilemma - what type of kodachi should I use? A matching wakizashi? A tessen (鉄扇) fan for the summer months, or as my instructor suggested, a tanto? I've detailed the history of the tanto in depth in 2 articles - here and here and I encourage you to check them out. So in that respect let's look at the History of this style of blade. The Cold Steel O Tanto is considerably longer than the standard tanto, which measures at just under a foot in length. I was able to purchase this blade at significant discount as it was a factory second, and as such would not be finished to the highest of Cold Steels standards. The seconds, those considered unfit for full price retail are graded into 3 distinct categories. A - the finest of the seconds ma have some cosmetic issues, B grade may have more serious cosmetic flaws and C grade may feature substantial flaws including a scratched blade, bent tip etc. "Level A has small cosmetic imperfections. To an untrained eye, an "A" sword may look just like a first. It will have one or more imperfections that disqualify it as a first sword. For example, the scabbard might be slightly worn, scratched or have a small chip. The blade may not be perfectly true, or be slightly out of specification in size or length. It might simply be shop-worn, having been used as a sample at a trade show or in our showroom, or possibly as a demonstration model from one of our videos." Overall, my initial impressions were quite positive, particularly in light of the fact that I was bribed with lollipops. I strongly feel all sword retailers should package their blades my lollipops. It's an automatic extra star. It arrived well packaged in a small cardboard box. A second smaller box, with a factory second label on the front was enclosed and surrounded with brown paper packaging. And aside from the most awesome lollipops they also included the current Cold Steel catalogue and their Absolute Proof DVD Series. On opening the second box, the blade was un-bagged (though a small tanto bag was included in the description), and half wrapped in green bubble wrap. On first glance I noticed a minor scuff on kojiri (the end of the saya / scabbard) and a second scuff, seemingly from adhesive near the koiguchi. There was some slight tearing and puckering of the samé (rayskin). The fittings looked solid. It was smooth on the draw and had a nice hefty weight. 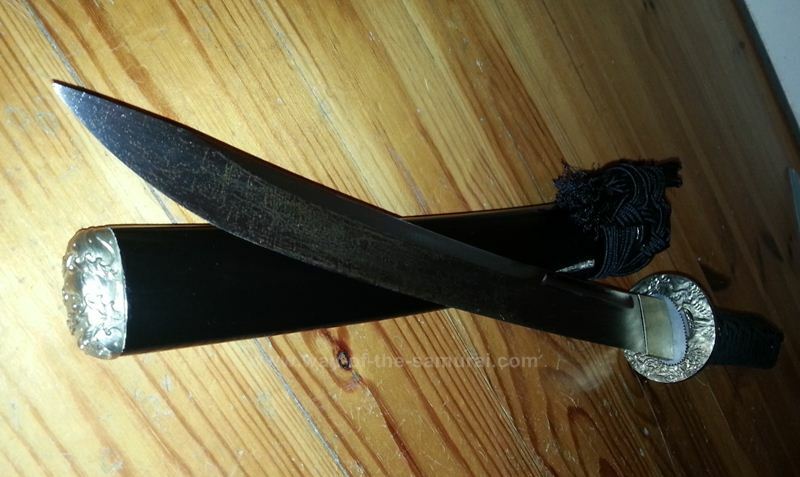 I noted it was a little loose around the tsuba (guard), seppa (spacers), and habaki (collar around the blade). The nagasa (blade) was fairly dirty and un-oiled, save for a very light amount in the bo-hi (etched groove) and along the mune (spine of the blade). Most satisfyingly though, I was able to get a small, but audible whistle with proper hasuji (blade alignment). Overall length: 19 3/8 "
Tsuka: 6 1/8" samé (RaySkin) Handle with Black Silk Braid cord. with Brass Menuki. Overall Appearance: It's nice and dignified, significantly bigger than the standard tanto. Upon seeing it in real life as opposed to simply via the net or catalogue the silver fittings look, to me at least, perhaps a bit cheap...? The Saya: Again significantly longer than the standard tanto to accommodate the hefty blade the saya is a nicely finished in black lacquer. As noted in the early impressions it is scuffed in 2 locations, but these are very minor and to be expected in a factory second. The koiguchi is nicely finished and without cracks. However on not are the small nickel-silver fittings of the kurikata - these were completely loose and I only discovered this on untying the sageo. The sageo also, is badly frayed and of lower quality material than the rest of the fittings. The Sageo can be easily replaced and the fittings of the kurikata can be secured with a little glue. This is by no means the end of the world and again, to be expected in a factory second. The Tsuka: Is short and surprisingly, tapered, comfortably allowing a one handed grip. The ito is a black silk cord, that is pleasing to feel in the hand and tied in alternating overlaps. The diamonds are slightly uneven, but it's all nice and tight, which is the most important aspect. I have yet to disassemble the tanto so haven't yet checked the wood, though it feels sturdy and robust. As noted in the initial impressions, the same wrap is a bit buckled and torn around the area of the mekugi, but this is the most minor if issues. Mekugi looks solid and secure. The Menuki: The menuki are ornaments placed on the tsuka, beneath the ito wrap. These are often used to secure a better grip on the tsuka and often feature excellent design and carving. 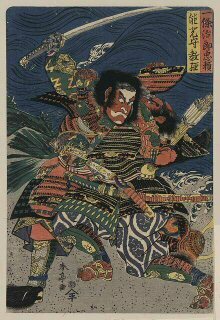 They tie together the artistic theme of the sword and often have specific meaning to the owner of the sword. On the Cold Steel Imperial O-Tanto, the menuki features a sea serpent or water dragon, and is made from a nickel-silver brass. The design is quite pleasing. It should be noted through that all of the ornaments on their Japanese Swords were revised in 2008. Depending on when you order and how old the stock you may get the pre 2008 design on the more modern ones. The Fuchi and Kashira traditionally are made of brass or iron and in this case are made of matching nickel-silver brass. The fittings here reflect the menuki and as we'll see in a moment the tsuba. The Fuchi (collar beneath the tsuba / hand guard) features rolling waves, as does the Kashira, which also of note is finished in a soft rounded fashion. The fittings have been cast well with an excellent depth of relief. The Tsuba (hand guard) is also made from nickel-silver brass and features the full sea serpent crawling round. Again it has been excellently cast with clear defined details. Though of a much smaller circumference it is worth noting that this O-Tanto features a full round tsuba, unlike many of the smaller tanto which have the smaller oval tsuba. I quite like this. It balances the size and length of the nagasa (blade) and is in keeping with the overall grandeur of the O-Tanto. Finally the habaki (the metal collar above the tsuba) is also made in the nickel-silver brass and is without ornamentation. It is simple and plain, and beautifully fitted to the blade itself. It's one of the best production fits of a habaki I've seen. One last note on the tsuka and fittings - there is a definite rattle and shake between the tusba and the seppa (washers). The Nagasa (Blade): The blade of the Cold Steel Imperial O-Tanto runs, as the name suggests longer than the standard tanto by several inches. This beast clocks in at 13 1/4, with an overall length of 19 3/8 ". It is fashioned from 1055 Carbon Steel that has been heat treated to a spring temper. 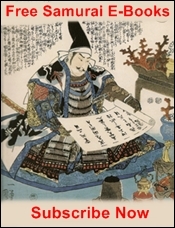 It is neither folded and thus has no grain (hada) nor is it clay tempered and as such as no hamon (incorrectly referred to as "temper-line"). Thankfully Cold Steel has not opted to go the cheap and tacky route and apply a wire brushed or laser etched fake hamon. At over 13" of thick steel this is a fairly bulky blade to use as quick and rapidly deployed knife. 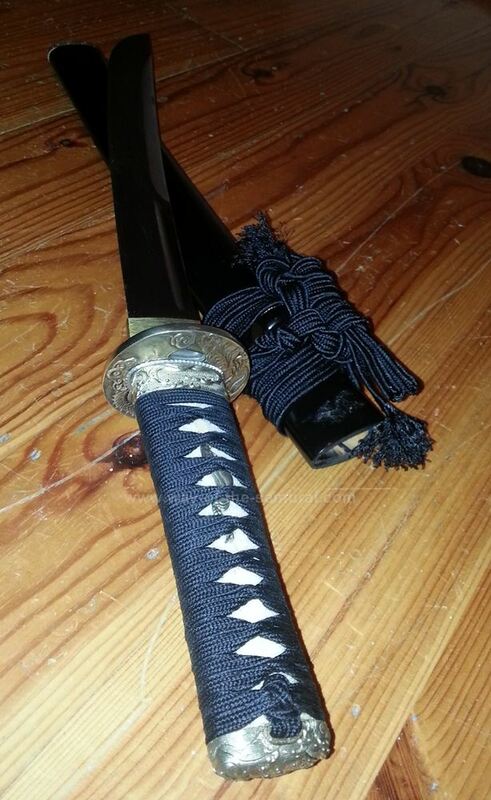 As such Cold Steel have looked to tradition and fashioned the blade in u-no-kubi-zukuri style. U-no-kubi-zukuri literally translates as the "cormorant's neck", became popular during the late Kamakura Period (1288-1333) with the Taima school, Ryokai, Shikkake Norinaga etc. In this blade type the ridge line (shinogi) to the mune (back or spine of the blade) is slanted and shaved, thus thinning weight from the sword. Viewed directly from the mune the tip of the blade (kissaki) flares outwards in a diamond head, the mune appearing as a thin neck before the blade once again flares out for the body just above the nakago / tang. The area where the blade flares once more, also has a short bo-hi (groove) carved into to both sides of the blade, again the purpose here is to lighten the blade. In this the Cold Steel Imperial O-Tanto succeeds. It retains significant feeling of heft and the weight of a serious steel blade while still being light enough to use rapidly and with fluidity and grace one would not expect. In terms of sharpness, while the Cold Steel site and catalogues describe this as fully sharpened - it simply isn't. The blade isn't dull, but I'd have a hard time cutting a steak with it. It failed an initial paper cut test, which I expected and I'll discuss the Tameshigiri later. Of course this is easy enough to rectify with a simple polish and the blade geometry looks sound. And in fact in my earlier impressions video I was able to produce a slight audible slice when cutting with proper alignment (hasuji). This didn't arrive particularly sharp. It can't cut paper that's for sure. Nor after later tests could it cut through a single tatami omote mat. It did manage one, fairly dull and jagged cut through a small plastic bottle, but it can't - in its delivered state - perform the feats of cutting legend as shown on the Cold Steel Promotional Material. That said, the blade geometry looks great, and I think with some studious polishing and sharpening this could be a razor sharp wicked cutter. 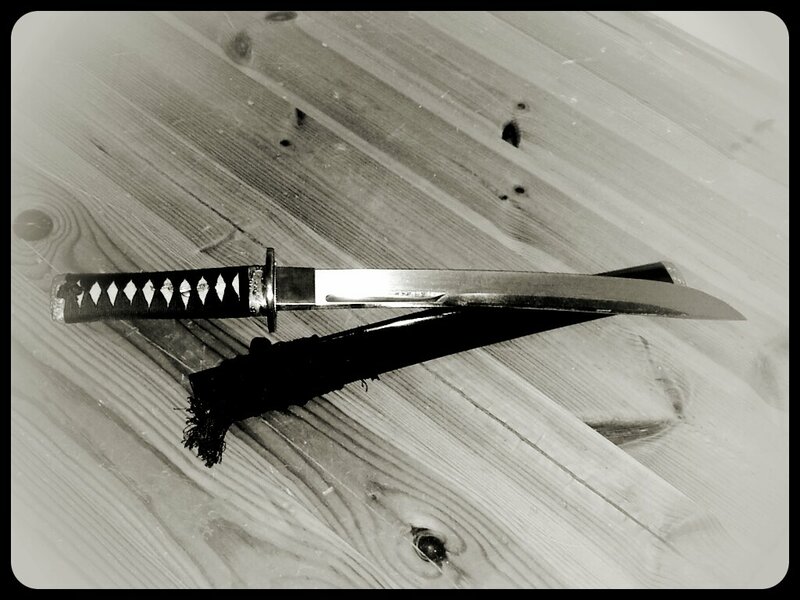 In the next few weeks I hope to spend some serious time sharpening the blade and re-testing. For a factory second this isn't bad at all. I'm not sure if it's an A grade factory second (a B I think would be a fairer assessment) but it certainly is a wicked and sturdy piece of blade. And ultimately that's what you want a tough, resilient blade. And that it certainly is. Are they're minor issues with the fittings? Yes absolutely, but you know what that's great in a way. This is a brilliant piece for a beginner to develop customization, sharpening and polishing skills on. The blade itself is excellent, there's a good niku (meat), opportunity to make small but impactful fixes and the opportunity to develop polishing skills on a blade that needs to be sharpened to truly bring out its best features. At the same time, it's cheap and a factory second so you can approach it as a fixer up project without worrying unduly about it - it's not a museum piece, nor an expensive blade, and considering that these retail for nearly 3 times what I paid, I think it's an excellent investment blade that one can develop their skill with. It also looks awesome at enbu and Iai demo's. Excellent base blade with sound geometry. Well cast fittings with deep relief. If you're in the market for a reliable tanto and want one that if push comes to shove could do the job, this is the Japanese equivalent of Rambo's survival knife. That said I wouldn't pay the full retail price for this piece - I don't think it could be justified. If you get a factory second and are willing to put in a little elbow grease, you'll have yourself a bargain though.